Editor’s Note: Today’s guest feature is submitted by Greg Moats, industry insider. I received an early Christmas gift this year; an autographed copy of Holstory, Gunleather of the Twentieth Century, written by my old friend and co-worker, Red (Richard) Nichols. Red was unquestionably the backbone of the creation and execution of the early Bianchi Cups and a behind-the-scenes driving force behind the Bianchi Gunleather Company. No one is better qualified to write the definitive book on contemporary gun leather than is Nichols. In May of 1982, I went to work for Bianchi and my initiation included a week spent in Temecula being immersed into the leather business. To this day when I go into the boot section of a well-stocked western wear store, the aroma of leather ignites my memory of that week. There are few depressions so deep or frustrations so disquieting that can’t benefit from the aromatherapy of spending time in a leather holster plant. Due to having shot in the first four Bianchi Cups, Red and I knew each other and he suggested that we take a day and build a prototype holster that he’d let me design. By that time Ross Seyfried had proven beyond any doubt that an FBI-cant holster could be competitive in IPSC and the trend was drifting away from muzzle forward designs like Bianchi’s Chapman Highride, Davis’ Usher International and Spark’s Hackathorn Special that had previously ruled the competition. 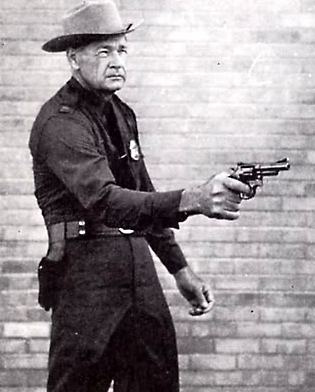 Compensators were making their debut on the circuit so longer bodied holsters were being built to cover the added mass at the front of the slide and keep front sight blades from snagging on the leather. Our collaborative effort resulted in the holster that you see pictured here with Red’s new book. It has the FBI cant, long body to cover the new Eddie Brown Maxi-comp I was using and cut low in the front to allow the muzzle to “clear leather” without excessive upward movement. Embellished with basket weave hand stamping and the inlayed Bianchi star, the holster is still a prized artifact from the earlier days of IPSC and my time at Bianchi. Ray Chapman started running classes in Columbia, Missouri prior to actually moving from California. For those first couple of classes, the Chapman Academy consisted of nothing more than a graveled parking lot which eventually became the moving target range. There were no permanent target frames, no building…..nothing. Ray was an “idea man” and talented at visualizing and creating. He mentioned to me one day that he was designing a match that would pit the best hand gunners from the three major forms of competition, Bullseye, PPC and IPSC against each other in a match that would be equitable and favor no particular discipline. Ray explained that Bullseye shooters were used to shooting at 8” circles, so the Falling Plates event would be comfortable for them. PPC competitions require shooters to engage targets from both the right and left sides of barricades, so they would feel at home with the Barricade event. 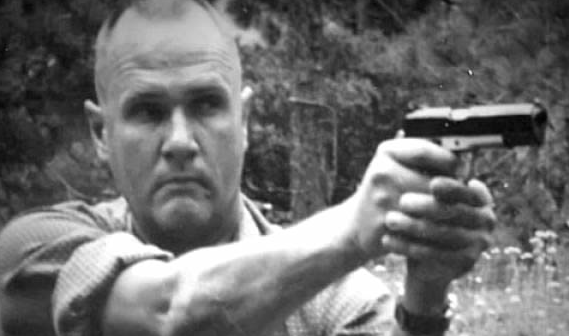 IPSC frequently forced shooters to engage targets with both right and left hands, so he devised an event to be similar to the “Advanced Military Modified” course that Jeff Cooper had made more-or-less “standard” for IPSC shooters, hence the Standards event. He envisioned the Mover to be the equalizer since almost no one had access to moving targets in those days. A few months later I received an invitation along with a poster (which I wish I had kept) to a match that was christened “The Bianchi Cup.” Participation in the Bianchi Cup was by invitation only in an attempt to bring the best of the best of the three disciplines together. As inducement, Ray wanted there to be significant awards which the sponsorship of Bianchi Gunleather would help garner. Ray told me that when the event became publicized, he got a call from a somewhat upset Jeff Cooper complaining that the match would drain the potential contributions from the industry and would have a negative impact on IPSC’s award-tables. Ray and Jeff were old friends and competitors with mutual respect for each other’s particular strengths; however, watching the two of them interact in the next couple of years I had the feeling that the warmth of their friendship may have cooled a couple of degrees thereafter. Enter Red Nichols. Mild mannered and soft spoken, Red was not one to toot his own horn, however he did the yeoman’s task in contacting industry folks, soliciting prizes and garnering support for the first handgun mega-tournament. Add his effort at scoring the results and distributing the prizes and you understand the comment that I made earlier about his being the backbone of the Bianchi Cup. Jeff Cooper, above, and Bill Jordan. 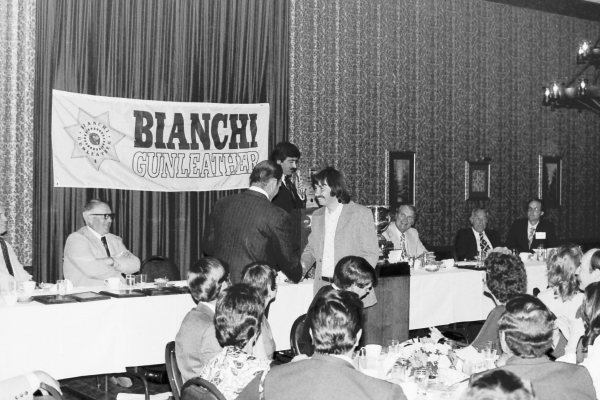 Richard Nichols at the far right at the table at the Bianchi Cup Banquet #1--Ray Chapman presenting an award to Bill Wilson (Wilson Combat)- Greg Moats photo. Then Cooper said, “to be practical, we need to pose a potential problem and let the shooter solve it with the tools and tactics that work best.” Jordan leaned forward and asked, “What did he say?” Red and I were the youngest in the room by a full generation and I’m pretty sure that we did most of the interpretation between the two old Marines. At the first break, I noticed that Harlan Carter and Charles Askins were waiting in the hallway to get a briefing from Jordan on the proceedings, neither were wanting Cooper to turn NRA “Practical” shooting into another IPSC. I can’t say that those meetings were a wise expenditure of the NRA’s resources, at least at the time. However, I guess that the frustrations of those early days led to what is now the highly refined and more aptly named NRA “Action Shooting.” I feel certain that “Action Shooting” would not exist in its current form, if it existed at all, without Red Nichols. 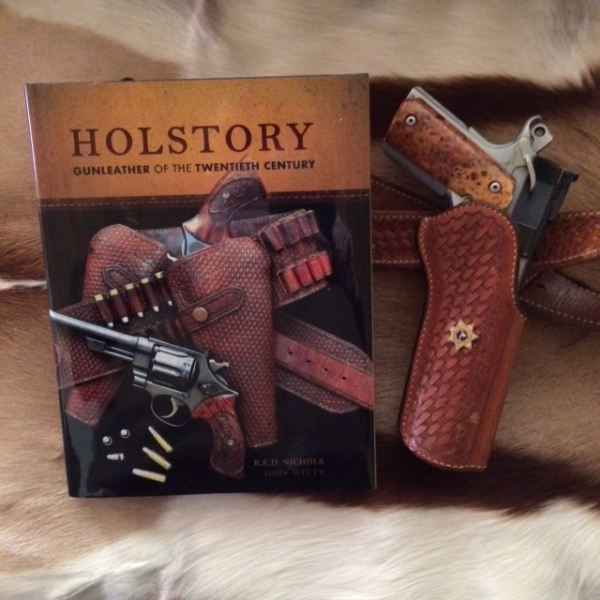 Holstory, Gunleather of the Twentieth Century, is a book that every student of the gun with an appreciation of “how we got here” needs to have in their library. No book has ever been authored by a better versed maven of their subject.